These babies are the most popular among DIYers (Do It Yourself). That’s because they’re super easy to install either by interlocking with a simple *click* or the even simpler peel-and-stick options. Garage tiles can be made of a durable polypropylene (basically a really strong high-density plastic composite), a flexible PVC material (people like this because it feels like rubber underfoot, it’s quiet and has some cushion to it), or peel and stick vinyl tiles . Easy to install: If you’re looking for a DIY installation, you can do this regardless of experience! Trust me. I helped with one recently and I have never installed a flooring in my life. It was a snap – literally – just snap the tiles together! No painter or installer necessary. 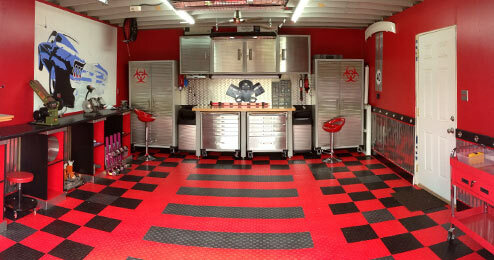 Color and pattern options: If you want full control over how your garage will look, this is a great option! Mix and match colors and patterns, add the classic checkered look, or add your own creativity–you have tons of color options in every pattern. Definitely fun for the creative type! Easy swap: Tiles are designed to be chemical and stain resistant. However, if one gets damaged, you’re not out the whole floor! Easily swap it out for a new tile and your floor looks like new! Price: Modular garage floor tiles have the widest price range of all the garage flooring solutions and can be the most expensive option. They range from $1.98 / square foot all the way up to nearly $6.00 / square foot. Like anything, you get what you pay for: The more expensive the tile, the more expensive the material (usually) is. Easy: Rolled vinyl flooring a.k.a. 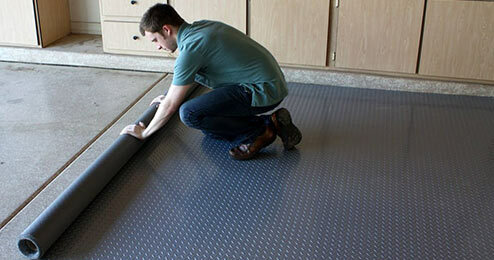 PVC flooring is the easiest garage flooring to install. All you have to do is roll them out, make any necessary cuts with a utility knife and BOOM! Sit back, relax, and enjoy your new floor! 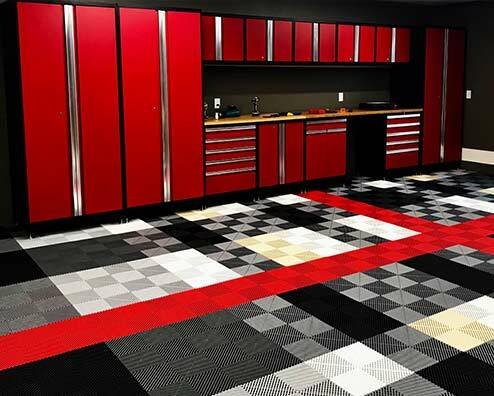 Color and pattern options: Although there aren’t quite as many options as garage tiles, garage rolls come in a variety of patterns including coin, diamond and more. You can also pick from several different colors. Maintenance: Maintaining vinyl flooring is super simple. All you need to do is sweep or hose off the flooring as needed. As a person who hates cleaning, I find this very appealing. 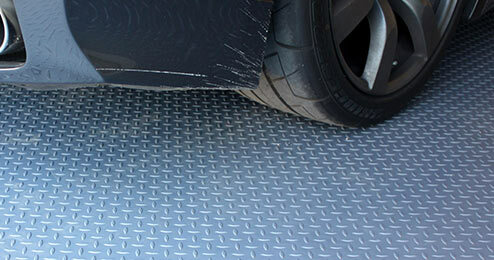 Cost: Vinyl garage rolls are also one of the lowest cost garage flooring options on the market. Prices typically range from $1.50 – $4.00 / square foot. The cost varies based on the thickness or grade of the vinyl, color (some colors can cost more to make than others), and whether you are purchasing a custom sized or pre-cut roll. Customization: Unfortunately, there is no way to make a custom design. You will always end up with a single pattern (coin, diamond, etc.) and a single color floor surface. Replacement options: Although PVC is chemical and stain resistant, what do you do if the roll does get damaged? The answer is (usually) live with it. Or, buy a replacement since you can’t just pop out and replace a section (like you can with tiles). 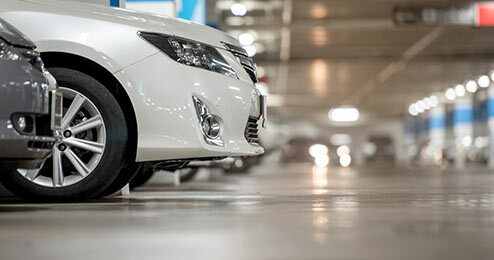 Time to shine: The secret about garage flooring rolls is that they don’t really look their best for 1-2 weeks. When rolls are shipped, it is not uncommon for flat spots to develop. When this happens, you may roll out your new vinyl garage flooring and see waves in the flooring that don’t seem to go away.Don’t panic! It usually takes 1-2 weeks for the vinyl to settle and the waves to disappear. Tiles, on the other hand, look great right away which allows you to brag about your new flooring immediately. And yes, we brag too. 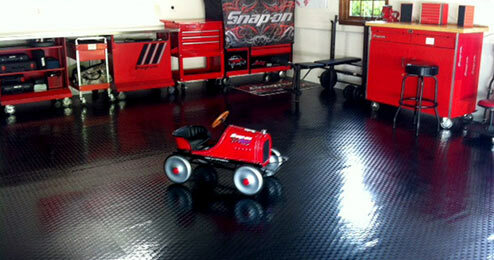 Don’t be shy about showing off your new garage flooring! 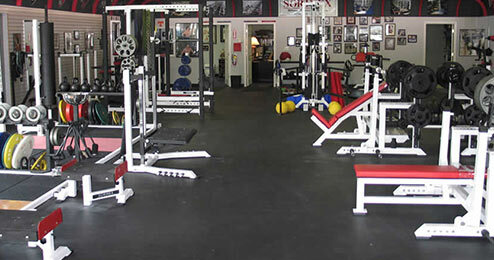 Price: There are epoxy options as low as $0.50 per square foot. What a steal! 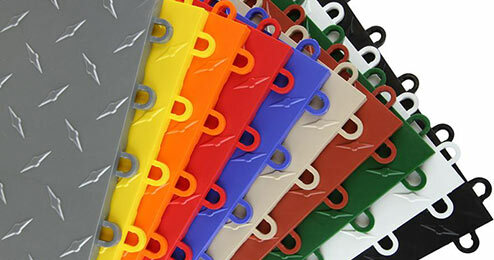 Color and texture options: Just like paint, there are countless color options. Then, you can decide between gloss, flecks, you name it. Preparation: Epoxy doesn’t just let you show up for the date in a t-shirt and jeans. Epoxy is a lady. You have to prep your floor pretty diligently to prepare for the epoxy application. This includes sweeping, pressure washing, grinding and then, sometimes, an acid wash. It’s definitely worth it, but if you’re a cut-to-the-chase type, it may not be your favorite. Durability: Epoxy doesn’t always last as long as garage floor tiles and rolls. If your subfloor cracks, your epoxy will likely crack with it. And it’s not as simple as reapplying. If your subfloor cracks, you have to fully repair it before reapplying the epoxy. Customization: While you have the ability to customize almost endlessly, this isn’t really something you can do on your own unless you are a professional. For a DIYer, we recommend just sticking with one look. Easy to clean and install: Just like traditional garage flooring, rubber tiles are easy to interlock together and the rolls just simply roll out. Easy peasy. You can keep your rubber clean by using a gentle cleaning solution. No scrubbing, no laborious cleaning days! 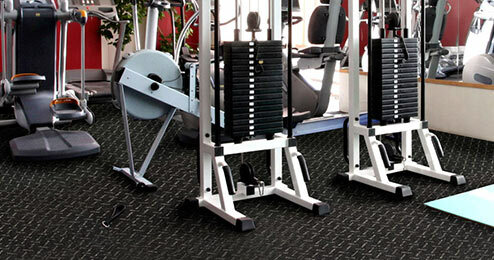 Durable: Rubber flooring is perhaps the most durable shock absorbing flooring option available. It can hold up to heavy weights – including the weight of your car. You can expect your rubber floor to last for years to come. Multi-purpose: Like I said, you can use rubber as a garage gym flooring, to park your car, for pets, locker rooms and so much more. Anti-microbial: Rubber is naturally antimicrobial and will not harbor mold, fungi or mildew growth. Score. 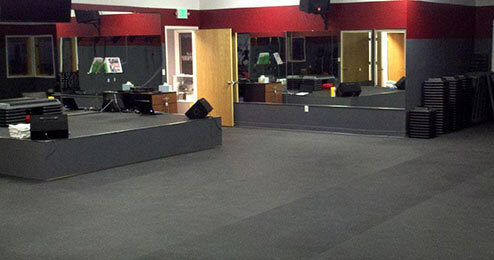 Sound dampening: Rubber is a natural sound insulator so if you plan on working with loud power tools, cranking the music or using your garage as your band practice space, you (and everyone inside) will love rubber flooring. Temperature insulation: So rubber will not make your floors feel warm when it’s 10 degrees outside. If you’re concerned about temperature, you may need to check out some other ways to insulate your garage or check out our floor heating solutions. Rubber and oil are not always BFFs:Unless you’re using vulcanized rubber, if you have a lot of oil dripping from your car it can break down the glue in traditional rebonded rubber. This can affect the durability and longevity of your floor. 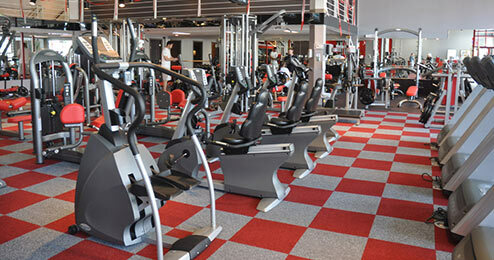 Durability: Carpet tiles are built to last and will stay strong until you are ready to redo your garage all over again. Maintenance: You already know how to clean carpet. Usually, it just takes a simple vacuum with a good cleaning every 5 or so years. Carpet tiles are even cooler because if you stain or damage a particular tile, you can swap it out, no problem. Color and design options: With a multitude of colors, textures and looks, you can easily create your dream look. Don’t forget; you can create fun patterns. You don’t just have to stick with one color/look. Softness: Although most carpet tiles are not your pillowy, plush carpet, it is still a softer flooring option. If you have kiddos that will be running around in there with you, it will be a nice little cushion for them. Also, it just immediately makes the room feel homier. So, if you’re going for that, it will be great. Water sensitive: Okay, so you do not want to dump gallons of water into your garage if you’re going with carpet. If you’re keeping boating or fishing equipment in there, it may not be the best choice. Rubber and traditional garage flooring options are designed to handle water. Carpet, unfortunately, is not. 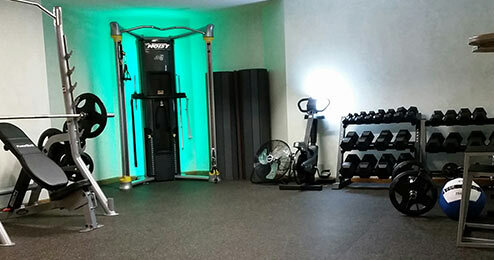 Installation: While interlocking carpet tiles and peel and stick carpet tiles are a cinch to install, other options require an installation professional, which can mean extra time and money. Not suitable for cars: I mean, we get that by now, yes? Don’t park on it, people! Garage use: As I mentioned, some flooring options are appropriate for traditional use and some are not. Check out each option and make sure it’s appropriate for your application. Budget: These options range from about $0.50/square foot to $6.00+/square foot. That is a huge difference. Make sure you know your budget ahead of time and try your best to stick to it. If you happen to fall in love with garage floor tiles and they’re a little outside of your budget, that’s okay. Just make sure you can go for what you want without leaving you with no garage door. Also, don’t hesitate to call us and let us help you find something for your budget. I like to think there is always a solution, even if we don’t know it exists just yet. Aesthetics: The fun part! Make sure you like the way your floor looks. You’re the one who has to stare at it.